Prominent South African businesswoman Dr Anna Mokgokong, who has been honoured across the world for her business acumen and contribution to her country’s socio-economic development, talks to African Independent about the gains and challenges facing African entrepreneurs. 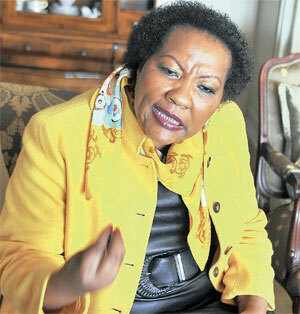 TOUGH AT TOP: Pretoria businesswoman Dr Anna Mokgokong has built a successful business career. African Independent (AI): How are African women doing on the entrepreneurship stage? Dr Anna Mokgokong (AM): As women entrepreneurs, we are passionate, hard-working, resilient and tenacious to seize opportunities and dismantle obstacles along the way. AI: Are you succeeding in dismantling the obstacles? AM: The patriarchal system, which is found globally, is one of the biggest obstacles. Despite that, women businesses continue to form the backbone of economies across the continent. AI: What were your own personal experiences which can hopefully motivate and inspire potential women entrepreneurs? AM: From a tender age I knew I was an entrepreneur! In primary school I traded sandwiches for cash! My love for business came while I was studying medicine to become a doctor. I sold handbags to my fellow students at university, the community and the university hospital. The business grew; I began to sell African clothing and curios; and when a shopping centre opened in our community, a friend said it was time for me to get my own shop even though I was studying at the same time. It was like an itch – that urge to start my own business. By the time I completed my medical degree I was able to sell that business and use the capital to establish a medical centre. I was resilient. AI: Briefly tell us the story of Afrocentric Health? AM: By the time democracy arrived in 1994, I had learnt to be open to opportunities around me and seize them and let no one stand between me and the opportunities. When the late President Mandela’s government designed the Black Economic Empowerment Act to redress past imbalances and provide black people with equal opportunities to prosper, I and my partners jumped at these opportunities. I received funding from financial institutions. This funding led to my journey of investing in health-care companies in a big way. In 1995 we invested in health-care and other businesses and built a company worth over $2 billion today. That’s where passion and hard work come in. AI: Journeys are never smooth-sailing. Can you share your personal experiences with Community Investment Holdings (CIH). AM: Indeed. When the markets crashed during the 1999 recession, our company, CIH, became bankrupt. This experience was a learning curve. We drew key lessons from the mistakes we had made. Challenges come all the time. I have learned that resilience, tenacity and determination are necessary ingredients for success. Luckily we had built something strong. A larger health-care company supported us financially, and gave us leeway to manage our hospitals ourselves. We became so profitable that later they bought us for a price we could not refuse. We reinvested the money in another business, called Afrocentric Health today. It has tripled in value since we originally invested. However we do not spend the money lavishly. Rebuilding and rebranding the company Community Investment Holdings in 2000 was painful, but we had to eat humble pie. Being on the ground teaches you a thing or two – humility and humanity. However, you just don’t want to be on the ground too often to be able to learn how to run a successful and sustainable business! A single mistake is more than enough. You must learn from it and get so good you never have to fall again. Like a baby learning how to crawl and walk. In the past we took the recommendations of “experts” and didn’t focus on dotting the “i”s. We didn’t pay attention to detail. We only focused on building the business and nothing else. So the birth of CIH gave us a new opportunity to do things right. We became “governance obsessive”, paid attention to detail, insisted on financials, mastered the discipline of getting legal advice and understanding legal implications, and we’ve learnt to negotiate more sternly. AI: What is your advice to current and future women entrepreneurs? AM: You have to get your hands dirty, get to know your business from the tea lady’s perspective, right up to the top, identify the gaps and bridge them, because failure to do that gets a lot of business people cheated in business. Nothing is given on a silver platter; you have to hunt for opportunities. Opportunities come day-to-day to “hunters” and the go-getters. I spend time thinking about how to hunt for the next day, and I do it day after day. Through technology and innovative mechanisms of doing work, entrepreneurs must work smarter. We have to be strategic in our approach towards business and not take a short-term view on entrepreneurship. Go through the system, get an education if you can, learn the skills and acquire knowledge, as education provides the foundation. This is what we must advise young and upcoming business people. AI: What should be the focus of women entrepreneurs? AM: We need to focus on how we can make women greater participants in our economy. We need to hammer out this message: Be passionate, resilient and tenacious, diligent and work with integrity. In summary, starting and running a successful business is tough – it takes much more than an idea and enthusiasm. Being an entrepreneur requires hard work, perseverance, a thick skin and huge risk-taking.